Thanks so much for Benson Marketing who invited me to the Nectar Wine Lounge to meet the fabulous Cheryl Murphy-Durzy and greet the wines of Clos La Chance. On a pretty postcard San Francisco evening, with delicious snacks in a sophisticated spot, these wines were the perfect accompaniment to good company and great conversation, including the Clos La Chance story. First, the 2006 Chardonnay, Santa Cruz Mountains, A clear, pale citrine color, the wine had a gentle but pleasant acidity. Kissed with oak, it was so delicious and refreshing I slurped it down before recording a whole lot, but stopped with a little in my glass to get whiffs of green apple tart and lemon custard. I loved the use of oak. The tasting notes detailed "...aged sur-lie for 10 months in 20% new French oak, 30% once filled French oak with the rest neutral French and American Oak". Nice! 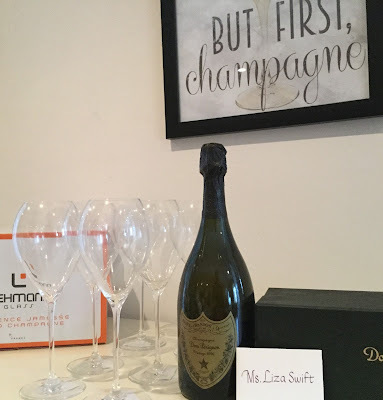 Next came the 2006 Lila's Cuvee. A Rhone blend, Lila's Cuvee blends 40% Grenache, 20% Syrah, 15% Carignane, 15% Alicante Bouschet, 5% Cinsault and 5% Petite Sirah. The color of this wine is amazing. An opaque ruby that made my mouth water. Aromas of dusky fruit , chocolate and a hint of vineyard earth enhanced my anticipation. Flavors of blackberries, cherries and earth underscored by pleasantly grippy tannins were delicious. 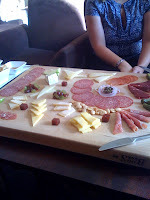 Especially with the almost too pretty to eat cheese platter. Almost! The salty tang of the cheese and hints of spice in the salami made a great match. My favorite match was Nectar's uber good Truffled Buttered popcorn with the excellent 2007 Pinot Noir, Santa Cruz Mountains. Talk about tasty! The color here was lovely as well, a garnet bright with promise. Promise fulfilled in aromas of earth, red fruit and something herbal/minty in the scent's core. Flavors of luscious juicy fruit along with a minerality typical of the region. Along with a bright yet soft acidity all its own. With the truffle popcorn? Yum! Batting clean up for the evening was the 2005 Estate Cabernet Sauvignon. This wine even looked lush as it came out a dark ruby. I found a kaleidoscope of aromas: blackberries, tobacco, licorice, faint herbal tone. The flavors were big and ripe with black fruit. Ironically, the discussion turned to how food was a necessary part of wine drinking, while I was thinking this was a nice wine with food, but the ripeness and the complexity made it something I would like to serve completely on its own. Delicious! Cheryl talked about her family's wine business as it grew from a backyard hobby to an 80,000 case concern. Initially they started out with an idea to cultivate small parcels of an amazing AVA into available growing areas. The focus and instincts that grew from that concept into such well-made and delicious wines is truly a success story. How fun to get to hear first hand! You can go see (and even better taste) yourself. Clos LaChance produces events on Summer Thursdays called "It's Time For Wine" where you can bring your own picnic, enjoy the sunset and the Clos La Chance wines. Ha! I am so going! Again, many thanks to Cheryl, Melanie, Colleen and Sarah for an awesome event. Next time I see Clos La Chance on a wine list I will be sure to dazzle my friends by introducing them to a great wine! so fun to meet you Liza. Let me know when you come down to the winery! Would love to see you soon. Cheers and thanks for the kiknd words about the family biz. And the wines! Back atcha, Melanie and Cheryl! That is some good wine! I will load the oher Chix in the car with picnic snacks. We were just talking about wanting to see Merlove! I think you would like the CabSauv too! 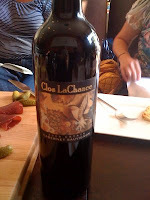 We carry Clos LaChance at Vineyard Gate, and the cab is one of the top sellers. At $12/btl it is one of the best QPR's for Cali cabs I've seen. Iron---Yes! Amazing QPR! I forgot to mention that, but you are right. Thanks for reading!